Explore LILLIY’S delightful and glamorous world on 40 fixed lines. 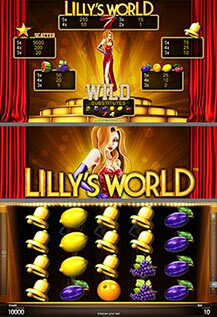 Let her seduce you into her entertainment-show and win up to 40,000 times your bet with LILLY as Wild symbol. Wild symbol substitutes for all symbols except scattered STAR. All prizes are for combinations of a kind, left to right on selected lines except Scatter. All games are played on maximum lines as long as sufficient credits are available.